The Pyramorphix continues the trend of excellence in puzzles from Meffert’s. The Pyramorphix is so much more than the name suggests, and is set to become a legend in its own right. The puzzle’s natural shape is a Pyramid, but it can be put in any of seven shapes. Because of this, a large range of artistic forms can be created. The Pyramorphix can be rotated around a central square by multiples of 90?X. The corners WILL NOT rotate individually as on the Pyraminx. The Pyramorphix rotates in a way that changes the position of center pieces not only with other center pieces, but also with corner pieces; this is what makes the different shapes possible. It has precision injection molded parts which make operation easy and exact. The idea of the puzzle is to scramble the colors and then return them to the initial state of four single-colored sides. 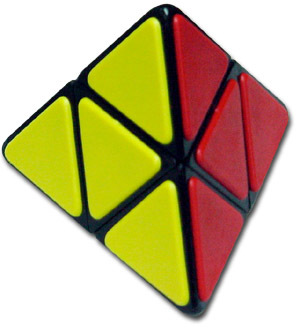 There are still only 3.2 Million possible positions of the Pyramorphix, but it is easily mastered within a week if you pay attention. Don’t worry if you can’t solve this: All of Meffert’s puzzles come with help, either in the form of a full solution or help tips. So that you won’t loose face with your friends should you encounter some difficulty in solving any of them.